Ashley Horton Designs: CK Sept./Oct. Top Ten Issue - GIVEAWAY!! 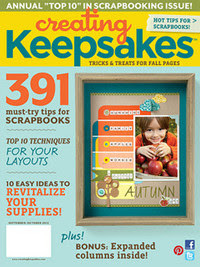 Creating Keepsakes September/October issue hits newsstands this week and it is packed full of Harvest and Halloween goodiness...and lots of other great ideas too! This is always my favorite issue every year! There is also some great Online Content that you can access for this issue. You can find free downloads, articles, techniques, etc.! Would you like to win a FREE copy of this issue? If so, leave a comment here and I will draw a random winner. Comments will be open until Sunday, August 19. Come back here on Monday the 20th and I will announce the winner!! Fantastic Ashley! Would love to get my hands on a copy. Congrats on the publication! you've been really rockin things lately! I can't wait to see your layouts in there! Thanks for the chance to win! Congrats!! LOVING the sneaks!! And thanks for the chance to win!!!! Congrats Ashley! How wonderful to have two layouts in the same issue! I am a subscriber so please don't include me in the drawing. Great sneak peeks! would love to win a copy!